When she has an actual role, it’s always secondary—the heroine’s best friend, the vamp, etc. I’m always glad to see her, and I think she’s a good actress (why was she not a huge star, why? ); but a film where she’s not given an opportunity to dance is just an astonishing and incomprehensible waste of her talent. So here are my favorite times where her dancing skills have not been thrown away (so far—I hope there are more gems to be discovered out there)! 10. “Behrupiye Log Sare” from Ek Khiladi Bawan Pattey (1972) (sung by Asha, music by Sonik Omi). She has two great songs in this film (please somebody put it on DVD with subtitles!). Vinod Khanna in disguise looking like John Lennon! Giant eyeballs! I really need to see this. 9. “Maar Diya Jai” from Mera Gaon Mera Desh (1971) (sung by Lata, music by Laxmikant Pyarelal). Laxmi had three great dances in this film and a good-sized role; this is my favorite of the three. Is she betraying Dharmendra now that she realizes he loves Asha and not her? The suspense! I also love the “snake music” sound. 8. “Ek Muthi Main Pyar” from Sharafat Chhod Di Maine (1976) (sung by Asha, music by Madan Mohan). Another crazy nightclub. Plus: Feroz! 7. “Do Pal Jo Teri Aankhon” from Baharon Ke Sapne (1967) (sung by Asha and Lata, music by RD Burman). Laxmi along with Bela Bose dances up a storm at a party. Just so entertaining to watch these two together! Plus: huge daisy earrings! 6. “Main Sharaab Bechti Hoon” from Raaste Ka Patthar (1972) (sung by Asha, music by Laxmikant Pyarelal). This is such a poignant performance—she is dancing crazily, seducing Sudhir, but you can feel and see the desperate unhappiness beneath the frantically perky exterior. Very powerful scene! (Sudhir is fab too). 5. “Main Ek Haseena” from Aaya Sawan Jhoom Ke (1969) (sung by Asha, music by Laxmikant Pyarelal). So much fun!!!! And she just looks gorgeous, even though she’s a little (just a little) chubbier than she usually was. 4. “Awara Ae Mere Dil” from Raat Aur Din (1967) (sung by Lata, music by Shankar Jaikishan). Laxmi shakes her moneymaker in front of my favorite band Ted Lyons & His Cubs. They paired together in the number one song and dance on my list too! 3. 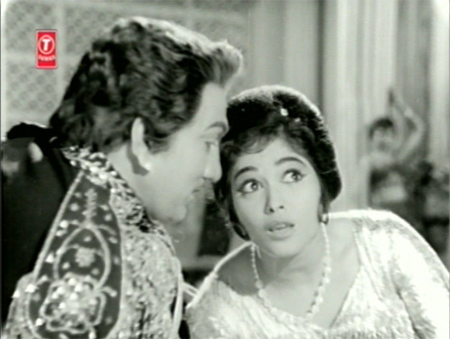 “Gulabi Raat Gulabi” from Upkar (1967) (sung by Asha, music by Kalyanji Anandji). Fabulous cabaret number and song; stands out even from all the other really good songs in the film. 2. “Nazar Meri Badi Idhar Se” from Rustom-E-Hind (1965) (sung by Asha, music by Hansraj Behl). This is just cracktastic. She looks like she’s having a seizure. The best part of this is her crazed shaking and shimmying: she probably single-handedly could have put a good chiropractor’s children through graduate school! 1. “Jaan Pehchaan Ho” from Gumnaam (1965) (sung by Rafi, music by Shankar Jaikishan). Could it be anything else? I think not! I never never never tire of watching it. Never. Post update: I have replaced the at best unreliable links to Youtube with video remastered and then uploaded by tommydan1 at Dailymotion. Thanks again Tom! Posted on April 29, 2009 at 6:10 pm in Hindi movies, Memsaab's lists	| RSS feed You can skip to the end and leave a reply. I don’t know much of her but shes very pretty and ooks like shes a great dancer! She is gorgeous I think, and what a dancer…honestly I’ve never seen anyone dance like her when she was going all out. I have no idea what happened to her—if someone reading this does, we would ALL like to know! i know that since long but not sure about year…at last i search and found some details at about link. Oh shame :( But good to know. The full link is this for anyone who would like to read it…it says she was only 57 (which would have made her 18 in 1965)…well, she’s dancing up a storm wherever it is we all go, I hope! Thank you soooo much for this post! I love Laxmi Chhaya too – she lights up the screen so beautifully when she’s there: and Jaan pehchaan ho, Maar diya jaaye, Do pal jo teri aankhon and Awara ae mere dil are some of my favourite songs. Interestingly, Awara ae mere dil is the only time Laxmi Chhaya actually appears in Raat aur Din – but I still associate Laxmi Chhaya very deeply with the film. Teesri Manzil AND Budtameez both threw away their chances at a Laxmi dance number. What was Shammi thinking???? I would have loved to see her dancing with him! But yes—Asha + Helen = an embarrassment of riches. Wow, she is so beautiful!! I don’t think I have ever seen her before and now I want to know more about her too. I love Jaan Pehchaan ho!! And I love the Beatles suits with the pirate blouses!!! She’s gorgeous, and she was a good actress too when given the opportunity. And – in Jaan Pehchaan Ho – who is the man at the microphone, singing? it’s not Mohd Rafi, is it? He is Herman Benjamin, who was a choreographer in the 50s-60s, famous for his “western” style. You can read more about him in this post. I think the singers for the song: “Do Pal Jo Teri Aankhon” from Baharon Ke Sapne are not Lata and Asha but Asha and Usha. She is very beautiful and certainly can dance. Maybe the reason she never became popular is that of all the films you mentioned, only very few ring a bell, so they must have been films that didn’t do too well, or were only seen by die-hard movie-goers. She was in a LOT of films though, and quite a few of them were hits. I guess she just never really made it out of the background in the bigger ones. Or because her dancing was so spectacular she ended up typecast as a vamp/dancer. You are going to make me a Lakshmi Chhaya fan. I just took her for granted, I guess, as one does all those wonderful extras at the back. But yes, she is gorgeous and vivacious. ‘Jaan pehchaan ho’ is a huge favourite of mine, too. I first noticed her in Mera Gaon mera desh as a kid and was fascinated by her. Afterwards I always thought she starred only in that movie and then got married and quit films or maybe died (!). Maybe the fact, that she turned plump in later days hindered her career! Thanks for the list! And thanks to you, i realised how many movies she starred in.! She was a little chubby and then slimmed down again actually…I don’t even know how many films she WAS in…she’s not always credited (the list at imdb is not nearly complete, I know that for sure). She jumps off the screen at me though, so one of these days I’ll do another list :) I left off quite a few of her more traditionally “Indian” dances because I just love the cracktastic cabaret ones so much. do you know by any chance what she does now? did she marry and quit films. Would e apity to hear that she is languishing somewhere…. :-( That happens so often! Laxmi, if you’re out there—tell us what’s up! didn’t your bollywood connections have a tip? Another invaluable post!! Memsaab, you are incredible. Next: Top Ten Bela Bose songs, please. But, I can’t get Baharon Ke Sapne on Netflix! I think Laxmiji never got her due because of the good girl/bad girl dichotomy in Hindi film. Fab actresses like Helen, Laxmi, Bindu etc. had more fun than the nice girls, but it is our loss–and cinema’s!–that they were never cast as heroines. Baharon Ke Sapne is worth owning :) Laxmi wasn’t such a vamp though as Bindu and even Helen…early on she generally played the heroine’s best friend, or the hero’s sister…but maybe since her forte was dancing like a crazy woman it put her beyond the heroine pale. I am with Banno. I had never noticed Lakshmi Chhaya till you started posting on her! She is beautiful and a great dancer. And I looove Maar diya jaaye and Jaan pehechaan ho. Yes, as with Helen I could do a whole second post on her more traditional style dancing, where she was equally adept. If you haven’t seen her other dances from MGMD do look at them on YouTube, they are great. I love reading your blog because I learn so much about Bollywood I”ve never heard of before! Lakshmi Chhaya is beautiful, can’t wait to catch her on film. Everyone should know about Laxmi :) Spread the word! Thanks… Lakshmi Chaya is now one of those background characters who you never cared to find out…. she looks so different in “Maar diya jay”… kind of lost her sparkle compared to the others… SHe looks like Mumtaz in your screen shot under 8… maybe why you could not zoom in on her… she seemed to be different in every movie..
And what a gem of a trivia you found… “Ted Lyons and the Cubs”…. I think she is pretty easy to recognize—that smile, for one thing, and her big wide eyes. You should see Mera Gaon Mera Desh just because it’s a goooood movie :) And she is great in it. She often dances (seemingly) totally out of control :-) It’s what I love about her. She looks absolutely gorgeous…now that you mention her, I’m going to look into all of the films of hers that I haven’t seen. BollAll the talented supporting leading ladies who were good dancers mostly played the vamp in Hindi movies (beginning with Helen and then Bindu, Aruna Irani, Jayashree T or Bela Bose). The other talented ladies who were not spectacular dancers played sister- example Farida Jalal, Nazima, Naaz) to the hero or the heroine or at times a friend of the heroine. And I did not know that Sonia Sahni is Sundari Khan’s sister! :-) I learn so much from you guys! The dance craze infact started with Cukoo (not Helen) who was a fabulous dancer in late 40s and 50s. She’s the one who helped Helen get a foothold! Why wasn’t she a huge star? Probably because she doesn’t simper enough. All the women from her era are the ones who could win gold medals at the simper olympics and LC is way too much woman to do it. Plus, once she got slotted, especially in those “scandalous” outfits, she stayed slotted. As Blue Lotus notes, Mumtaaz is till date the only vamp who ever made it up the scales and she did that by playing smart and dressing relatively demurely for a vamp. It’s especially frustrating because both LC and Bindu could act the pants off most heroines in their day. To revisit one of my pet peeves, I have no idea why someone as unfortunate as Babita became a star albeit a B-list one but one who starred opposite A-listers but Bindu and LC had make do with bit roles with which they still managed to steal the movie. LOL @ the simper olympics!! You are a cruel woman, Amrita, but fair. Kumkum was good too, and she was a very good good dancer. She did a few lead lead roles and I thought she did a fine job as a heroine in Mr. X in Bombay with Kishore Kumar (on which later Mr. India was based) and Ek Sapera EK Lutera with Feroz Khan. I wonder if Laxmi Chayya did any lead roles in Hindi or any other language movies. I don’t know about other language films, but I think her best role in Hindi films was in MGMD. These talented girls didn’t migrate down south those days to get good roles and recognition unlike the north indian and bengali gals of today! 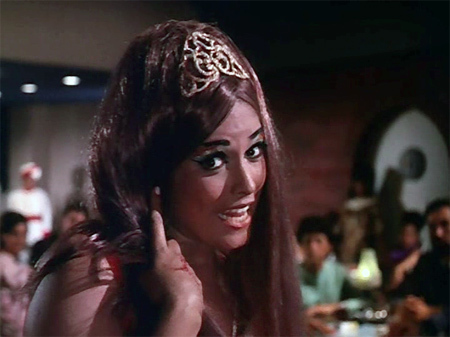 BTW, Laxmi Chhaya has a fairly substantial role in the Sanjeev Kumar-Snehlata-Nadira starrer Insaaf Ka Mandir (1969). The film’s pretty average (and obscure), but Laxmi Chhaya, though not the lead, has nearly as important a presence as in Mera Gaon Mera Desh. Thanks! I’ll look for it! bollywood deewana brought this song to our notice at dustedoff’s blog! Someone above had pointed me to that article :( Very sad. And any Laxmi lover is a friend of mine too! She was great. I will certainly try to login atleast once a week and try and help you build a robust database of most of the info you might need to enhance this website. You are doing a wonderful job Memsaab. Keep it up. Laxmi Chayya, may her soul rest in peace. Yesterday, I watched Khandan, a rather dreary Sunil Dutt/Nutan movie that was recommended by the owner of a video store in Jackson Heights, who when I took my pile of DVDs to the checkout, wordlessly added this one to the pile. But it has a couple of awesome songs, including “Meri Mitti Mein Mil Gayi” which on my song subtitled Shemaroo disc (yeah for song subtitling!) is all about how rotten men are. Helen and Laxmi. http://www.youtube.com/watch?v=t_wa8rgOxVI. I never, never would have known Laxmi’s name if it hadn’t been for you. I’m awestruck by your knowing the names of virtually every supporting player in classic Hindi films. Memsaab zindabaad! Oh I’m glad Mein Sharab Bechti Hoon is up on YouTube! It wasn’t there when I wrote this :) And thanks for the other link too! Yes, Sunil has an unfortunate boyhood kite/electrocution accident which cripples his right arm and leg, but Nutan loves him anyway. Really? Jeevan Kala? I thought it looked like Laxmi, but, naturally, I defer to you in all such matters. Someone else to watch for. You are too good. Not me, the DVD credits list Jeevan Kala :) It’s often hard to tell them all apart with poor picture quality plus all the makeup and feathers and so on…unless there’s a good closeup of the face. You have to know the names to look for to sort out the cast list, and isn’t Jeevan a man’s name? So, I’d never be able to match the face to the name without prompting. I agree, the make-up can be quite a disguise, too, and the 60s are so uber stylized. 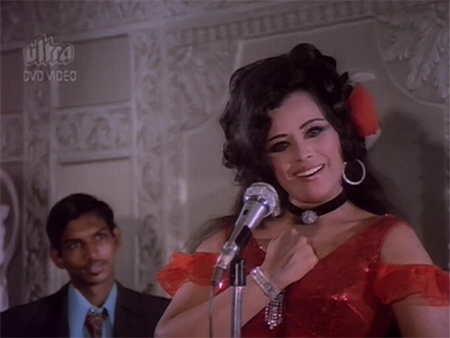 Laxmi Chhaya’s dance in the song ‘Aawaara Ae Mere Dil’ from the movie ‘Raat Aur Din’ is outstanding. She was truly a wonderful dancer. Her dance in that song as in many others, is truly faultless and so free flowing. Amazing dancer. I was pleased and honored that you chose one of my Laxmi Chhaya videos to feature but, sadly, I’ve been suspended (again) by YouTube and the link no longer works. I feel badly about that, at least partly because you’ve been hesitant in the past about linking to videos for that very reason – they sometimes get removed by YouTube. As you may or may not know, I’m also a fan of Laxmi Chhaya and featured a playlist of her videos on my channel. If you like, I can send you Jaan Pehchaan Ho (and many others) for you to upload to your own channel, so you can relink to it in this post. E-mail me if you’re interested at all. I have mentioned it in the past that one should not rely on youtube. One should upload videos on dailymotion and . That is the best bet and it is possible to link from there in wordpress.com blogs. Since long I was trying to get some information about Laxmi Chhaya. I saw few of her pictures. The last one was Teesai Manzeel. Then I forgot her name. I could not remember. But she was always there at the back of my mind. Today I found her after so many years, in beautiful dancing poses. I wanted to make enquiry, ‘how she is doing?’. Alas, just came to know that she is more in this world. God, I felt heartache. She had a beautiful, cute face and was very attractive. She was a fabulous dancer and given opportunity was a great actress. Hi Manda :) Glad you found us here—we love love love Laxmi. I was very sad to hear of her all-too-early demise as well, but hope that the time she had on earth was happy. She certainly always brightens my day when she appears onscreen. I happened to see a movie & this woman really caught my eye with her acting & her beauty. The movie was in Marathi “PAIJECHA VEDA”. She plays a housewife who is raped by by the dacoit which even causes her husband to go crazy and how she avenges that brutality. I wonder if she did act in any more Marathi movies? I would ike to thank this site for finding info about her. We will miss her! There really isn’t nearly enough information about Laxmi Chhaya out there…but I never stop looking :) Thanks for the info on this film, I’ll look for it too. Yes, thanks for your interest in my comment & a quick answer to it. Appreciate it, Ms. M.
Infact I never knew about her until I saw the movie & was curious to know about her… nothing much on the net about her until I found your site where you mentioned about her career. Thats a good research & info for people like me who need to know about smaller artistes who sometimes do not win accolades for all their hardwork! Also in the marathi movie she has some wonderful dances & its difficult to take eyes off her beauty in the traditional “nav-vari” saree! Thanks once again! Laxmi must have been trained as a classical dancer. Her jugalbandi with Madhumati (another good classical dancer who got sidelined) was very good in Suhaag Raat. Laxmi dances as the Peacock and Madhu as the snake. Watch it on Youtube and you will know they were trained in classical dance. Thanks so much… I also absolutely never get tired of watching Jaan Pehchaan Ho…! Check out the youtube link. Yes, indeed! with Johnny Walker (and Birbal) to boot!!! What Sanjeev Kumar as Alibaba! Wow! Didn’t know that! With the lovely Rani!!!! How fun. I have this movie but since it’s not subtitled I have to be feeling particularly intelligent in order to take it on, and that doesn’t happen very often these days. Is he Rani! Good to know that! I seem to be on a laxmi ‘discovering’ spree. how did I overlooked bela? Thanks for the info on this lovely lady. Very overlooked and she was an absolute doll who could really dance. If you want more information on Laxmi Chchaya I have information on her nephew who has indicated he is willing to answer questions about her. Amazing woman… love her in Jann Pehechaan Ho which I watch repeatedly! Hello, my name is Jonas and I’m from Chile. One day by accident I saw a video of Laxmi and fell in love. I have 25 years and despite the distance, I must say she inspires me a joy and a unique beauty. Especially in the video of Rafi, Jaan Pehchaan Ho. Hopefully you can get more information on what was his life after his career as a dancer and how he lived his days away from the lights. Greetings from South America and thank you very much for showing the art of this beautiful woman. 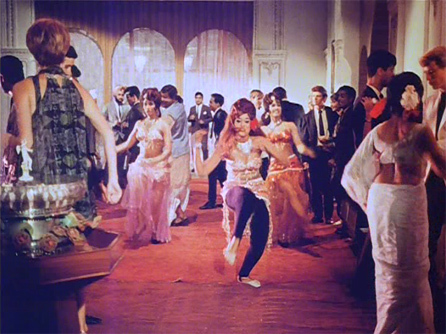 You should check out the song “Tu Hi Meri Lakshmi” from Duniya (1968) featuring LC & Johnny Walker. Seems like the lyricist has tailor-made this song for LC. And she looks gorgeous as ever. yes its been a long time coming here on this thread once again Memsaab :) but what the heck since its almost 10 years since the lovely Laxmi Chhaya left us I thought why not share all the search results on her via youtube, so here goes “http://www.youtube.com/results?search_query=laxmi+chhaya+marathi&oq=laxmi+chhaya+marathi&gs_l=youtube.3…9042.13251.0.13650.17.16.1.0.0.0.208.1954.3j12j1.16.0…0.0…1ac.1.11.youtube.su1iDNIakKY”. This results all her Marathi performances and as a certain Mr Sasoon pointed out she was quite big in the Marathi industry most notably like he mentioned in a film called “Paijecha Veda” hope you like it. Aawara song in Rat aur din was beautiful and amazing… The song made me fan of Laxmi Chaya.. Thanks for the informations provided by all Laxmi Chaya fans…. Laxmi chhaya madam was really a good and energetic dancer. Her movements were very crisp and fast. Her talent can’t be ignored. She is the best. Hi, just stumbled on this site, as I am grew up in 70’s watching movies in small town India. I was 8 year old, when my family watched ‘Mera Gaon mera desh’. My Dad was hooked to Mar diya Jaye. But I was fascinated by ‘Apni Prem kahanian’ from the same movie, this was best song of laxmi chhaya for me.